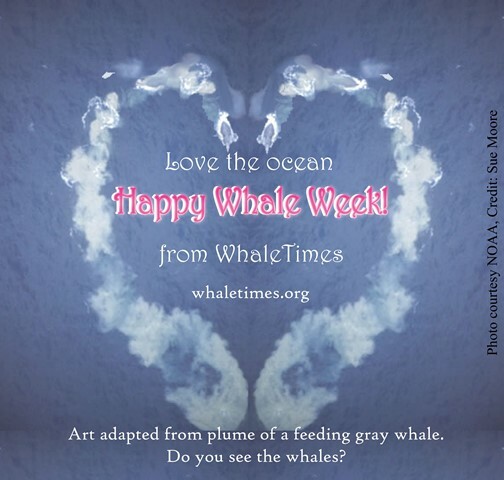 In celebration of Valentine’s Day and NOAA’s Whale Week, we’ve made a special card. Florida here we come! How do deep-sea animals use light to communicate? What would it be like to look through the eyes of a deep-sea animal? How do ocean scientists use DNA to study deep-sea populations? 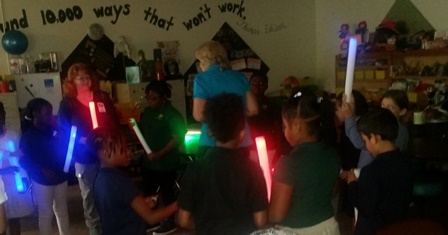 Next week, K-6th grade students from Broward County School will find out! 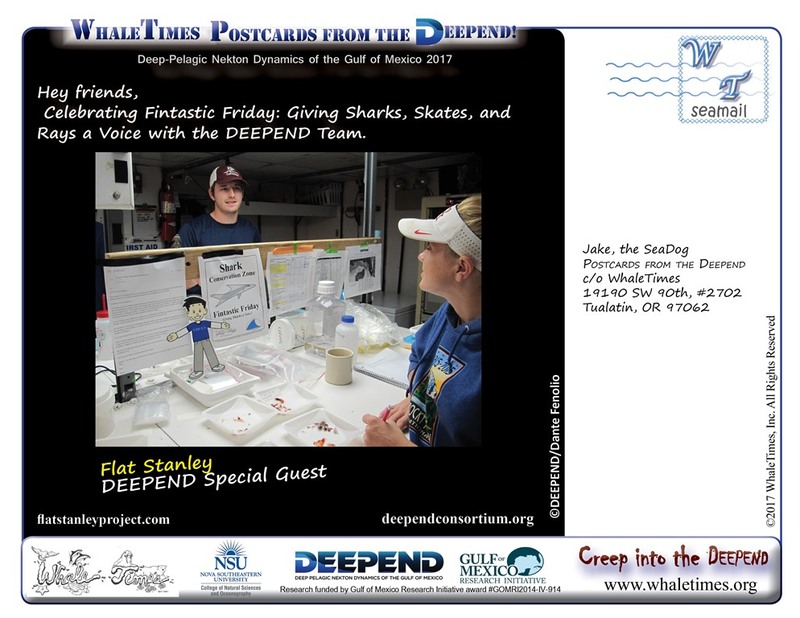 Dr. Tamara Frank, deep-sea explorer and professor at Nova Southeastern University and WhaleTimes Director Ruth A. Musgrave will spend the week traveling to schools throughout Broward County Florida sharing Dr. Frank’s deep-sea research. Cool kids. Cool speakers. Cool sharks. 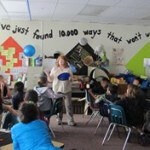 We may be having a heat wave here in the Pacific Northwest, but it’s been a cool week for our Sharks vs People program. 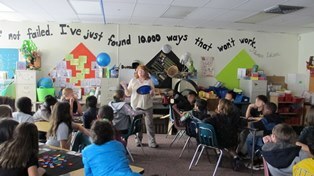 Trista and Sage, shark experts from the Oregon Coast Aquarium shared their expertise with summer camp students at two cool science centers — the St Louis Science Center and the Science Center of Iowa. Sage, Trista, and the Oregon Coast Aquarium. Thank you! 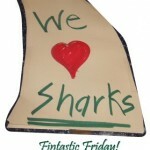 Today is Fintastic Friday: Giving Sharks, Skates, and Rays a Voice! Celebrate with us. Tell your friends. 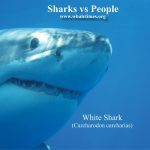 Post a Shark Conservation Zone sign and more! 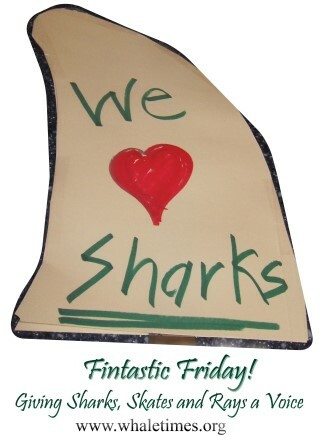 Flat Stanley helps WhaleTimes and DEEPEND scientists celebrate Fintastic Friday. You can, too! 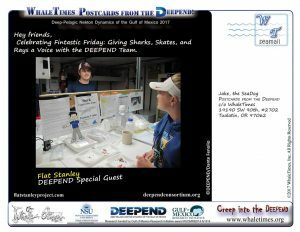 Posted in Creep into the DEEPEND Summer Camp, DEEPEND, Fintastic Friday, WhaleTimes Updates | Tagged Fintastic Friday, kids, MISSION: SHARK RESCUE, Sharks vs People | Comments Off on Today is Fintastic Friday! Vaquita: Landmark Fisheries Management Accord Reached in Hermosillo! Since it is Save the Vaquita Month, we thought we’d share this news with you. On February 27, 2018, in Hermosillo, Sonora, MX, the Intercultural Center for Desert and Ocean Studies (CEDO) and fisheries authorities from the Mexican National Commission of Agriculture and Fisheries (CONAPESCA) and National Institution for Fisheries and Aquaculture (INAPESCA) met with Sonoran fishermen to seal their commitment to fishing sustainably in a region known as the “Puerto Peñasco to Puerto Lobos Biological and Fisheries Corridor.” This is a leap forward for the conservation of natural resources and ecosystem services in the upper Gulf of California, which has been infamous for the inter-sector challenges and conflicts associated with preventing the extinction of the vaquita marina (Phocoena sinus) and lucrative, illegal fishery for the endangered totoaba, of which the vaquita is collateral damage. Without ignoring this difficult situation, CEDO has moved its focus towards an area that years ago reached out for help in order to establish an ordered, equitable and sustainable artisanal fishing industry. Participants at the meeting included municipal, state, and federal government officials, environmental and academic organizations, and artisanal fishermen representing six fishing communities including Puerto Penasco, Bahia San Jorge, Santo Tomas, Desemboque, and Puerto Lobos. All parties agreed to formalize the Corridor as a special area for the integrated management of coastal fisheries and the habitats that sustain them. Tens of thousands of artisanal fishermen depend on the highly productive waters of the Corridor ecosystem, which sustains more than 50 commercial species, including crab, snail, elasmobranchs, and scale fish. For the past three years these communities have been compiling, analyzing and building consensus for establishing a network of Fisheries Refuge Zones, community-based management areas, catch-quotas, and permits that strengthen fishing rights and keep extraction at sustainable levels. It is now clearer than ever to the fishermen of the Corridor that sustainable and resilient fisheries require a healthy and productive environment. CEDO, a Tucson and Puerto Peñasco based environmental non-profit organization, working in the region for the past 38 years, has succeeded in engaging small scale fishermen with scientists and decision-makers in order to find reasonable solutions to the complex problems that surround this chaotic industry. In contrast to the top-down approach taken in the upper northern Gulf to prevent vaquita mortality, the Corridor Program focuses on buffering the primary economic activity currently sustaining local communities: Fishing. The Corridor Program builds on fishermen’s experiential knowledge, fine-scale ecosystem and species-specific data that fishermen have helped to collect, and good relationships among different sectors, to facilitate a transparent and participatory process known as Coastal-Marine Spatial Planning. In the near future, CEDO hopes to bring other stakeholders into this framework to reduce future conflicts and maintain high standards of environmental and community well-being. CEDO also aims to create clear market incentives that reward fishermen who work according to best management practices, bringing sustainable seafood to communities like Tucson where it is in high demand. Saving vaquita and other ocean animals is also up to you. Be vocal about protecting these animals, raise awareness of the horrible effects of black market/illegal fisheries, and where you can have the biggest impact is to demand sustainable seafood when you buy or eat seafood. To learn more, check out our What is Sustainability fact sheet. 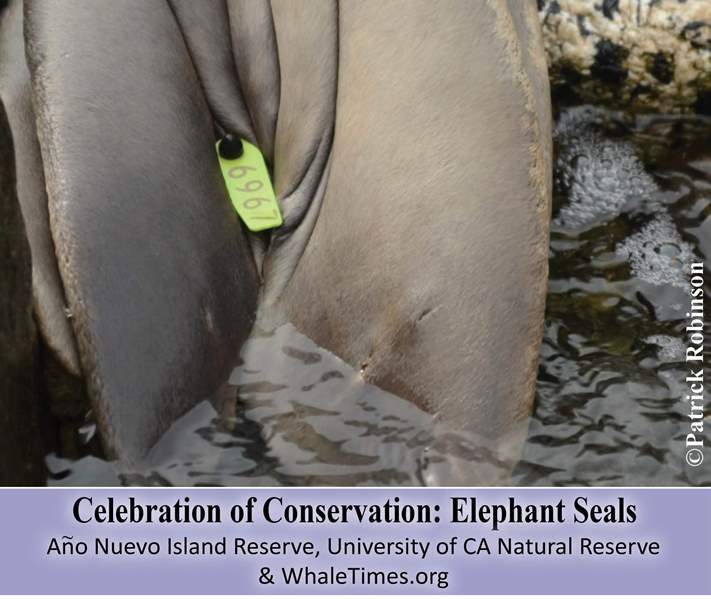 Posted in Save the Vaquita, Sustainable Seafood, Vaquita, WhaleTimes Updates | Tagged Celebration of Conservation, kids, Save the Vaquita, sustainable seafood, Vaquita | Comments Off on Vaquita: Landmark Fisheries Management Accord Reached in Hermosillo! 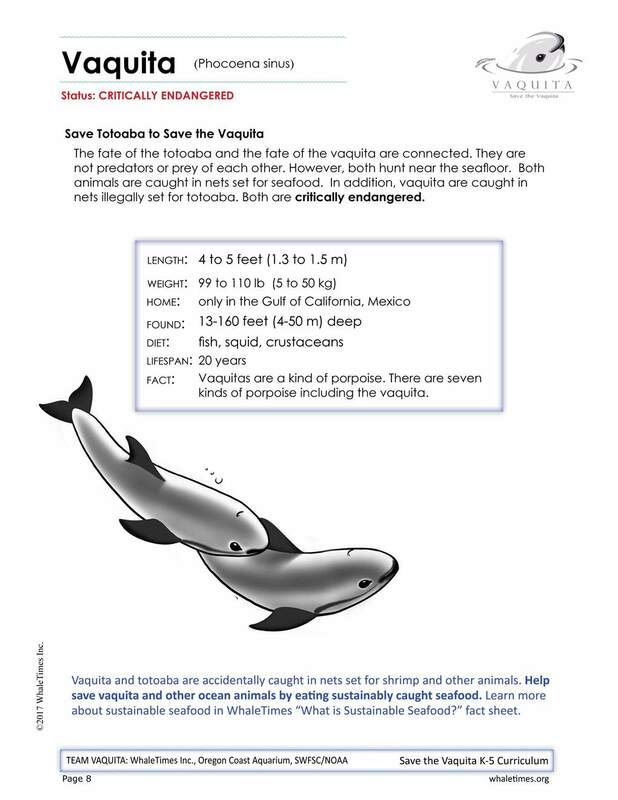 SAVE THE VAQUITA Month (and last year’s Year of the Vaquita 2017) are a collaborative effort of Oregon Coast Aquarium and WhaleTimes, Inc. with technical assistance courtesy of Southwest Fisheries Science Center, NOAA Fisheries. 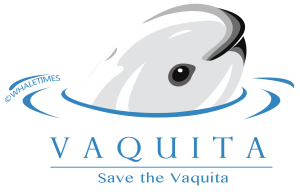 Join TEAM VAQUITA and help us save vaquita, sea turtles, sharks, and other ocean animals. DEMAND sustainable, traceable seafood. 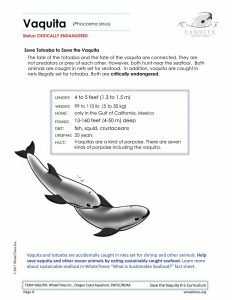 Helps us save vaquita by raising awareness of the critically endangered vaquita and totoaba, remind everyone to only eat sustainably caught seafood, and celebrate all the ways people are helping to save the vaquita and totoaba. More information about the status of the vaquita and conservation efforts available on the SWFSC/NOAA website https://swfsc.noaa.gov/MMTD-vaquita. 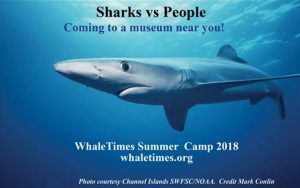 WhaleTimes announces this year’s summer camp, SHARKS VS PEOPLE. 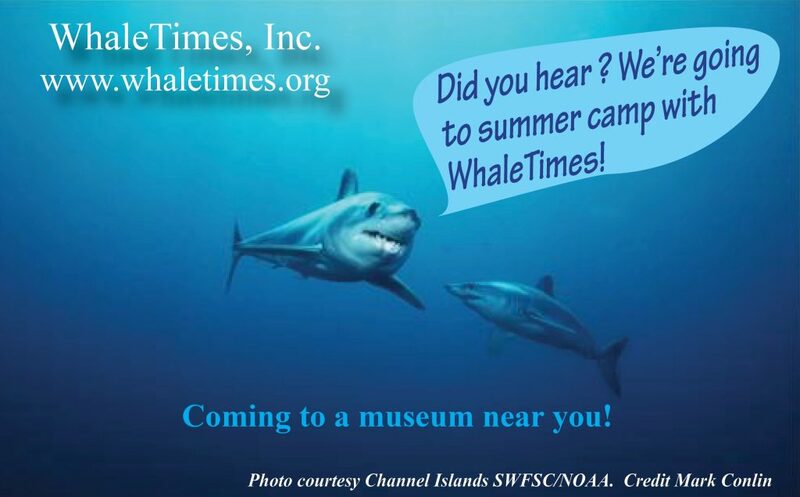 Great whites make headlines. Hammerheads send chills down the spine. Even the prehistoric (and extinct) Megaladon shark has attained legendary status as a monster. The truth is, you’re more likely to become a professional football player, injure yourself fixing the toilet, or get a spider bite than attacked by a shark. More than 500 sharks roam the seas (and some rivers). Some are longer than a school bus. Others swim faster than a killer whale. 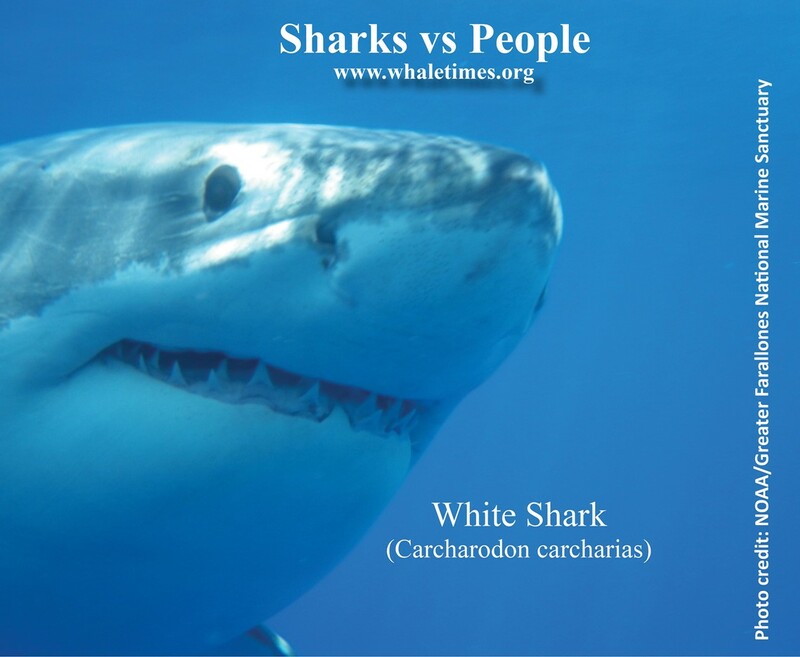 Some sharks can change color. Many glow in the dark! Sharks’ undeserved fearsome reputation overshadows the real story. The most dangerous animal in the sea is people, not sharks. Many shark species are threatened or endangered. They need our help to save them. 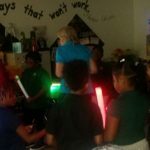 Find out how in this fun and exciting class. WhaleTimes’ Sharks vs People Summer Camp introduces kids to shark adaptations and species. Throughout this program, special guest Ruth A. Musgrave, author of MISSION SHARK RESCUE (National Geographic Children’s Books) and EVERYTHING SHARKS (National Geographic Children’s Books), shares her love of sharks, introduces amazing sharks, the scientists who study them, and empowers kids to help save sharks. 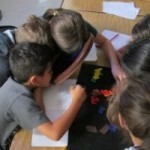 This program offered through museums and science centers throughout the country. Welcome Teachers. This month we’re posting some of the blogs and activities from our most recent Virtual Research Missions: Celebration of Conservation and Creep into the DEEPEND. We’ll post the email from the Science Team member, plus photos, videos, activities, Explorer mini-posters (bios) or other related information or links. 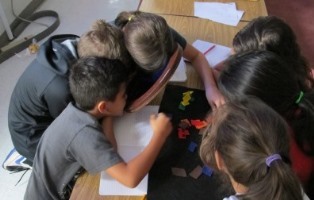 For our programs, teachers pick and choose, mix and match the blogs, photos, activities…etc. in what ever way works best with their class.